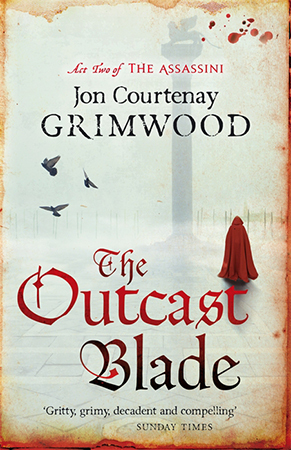 This is another of those books that has been short listed for a BFS award, therefore a number of people think it has merit. 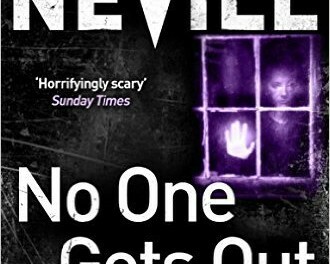 Adam Nevill is a horror writing with a steadily increasing following. In each of his books to date he has tried, and succeeded, in approaching horror from a different direction. In this novel, as in several of his others, Nevill takes a situation that is capable of creating anxiety, or even fear, in the mind of the protagonist. It may just be that they have made wrong choices or that circumstances have changed. In Apartment 16 being alone in a building when all the residents were asleep behind locked doors was the starting point for the unnerving to be lurking in shadowy corners or behind those doors. In The Ritual it was being lost in a strange place in the cold with no sign of human habitation that played on the fears of the characters. In this novel, No One Gets Out Alive, the setting is Birmingham. Stephanie has taken a room in a dilapidated house and from the first night that she moves in, she feels uncomfortable. Old, largely uninhabited houses make noises. It may be the plumbing or infestations of mice. Whatever the cause, the imagination distorts the sounds and adds other dimensions to it. After a series of poor decisions, Stephanie is desperate for somewhere cheap to live – she is on a zero-hours contract with an agency so money is tight. The place sounds good; the ad said girls only and clean. The latter, she finds is certainly not true and she has yet to meet anyone else living there. The sounds she hears in the night could be made by other tenants except they seem to come from strange places such as behind the fireplace or under the bath. She tries to rationalise it by the noises travelling along pipework but the thoughts of rodents makes her want to leave. Without money she is trapped. Circumstances conspire against her. 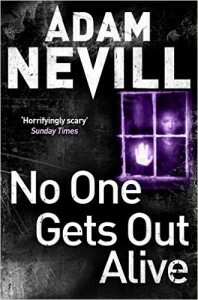 At some point in his narratives, Nevill introduces a supernatural element. When Stephanie hears a woman sobbing in the empty next room, she begins to suspect ghostly activity. She doesn’t care what causes it, she just wants out, but Knacker, her landlord, refuses to give her her deposit back. He seems relatively harmless. Then Knacker’s cousin, Fergal, arrives from London with two girls. For a moment, Stephanie is relieved. Fellow tenants should give her a better sense of security, until she realises that the girls are prostitutes and Fergal is dangerous. To begin with, Stephanie wants to escape from the supernatural aspects of her situation, which she half believes is her mind playing tricks on her, then Fergal kills one of the girls. The situation goes from bad to worse over nine days. The escalation of the fear is well handled but despite Stephanie’s naiveté in getting into a situation she can’t handle, she does tend to play the helpless female a bit too much at the start. As her situation worsens, she gains in character. She starts off very wimpish and changes as the horrors do. If anything, this section is too drawn out and the events could be intensified by crisper writing. At the end of the nine days, the novel switches track to three years later. It has taken that long for the participants to set up the resolution of the events that started long before Stephanie made the mistake of taking a room in the house. This second part has a feel of a more traditional supernatural novel. It is well handled, especially the hysteria and disbelief that accompanies the characters. Though the first section would have made a complete, nearly satisfying novel on its own, there are a few questions that Nevill feels he has to explain or resolve in the second part. This second part couldn’t exist without the first. While this had merits as horror fiction, it does come in a bit long. It will be interesting to see how the BFS award judges consider it against the other nominees for Best Horror Novel.